Suffering from Recital Burnout already? Contact us today to find out how to avoid burnout by using a turn-key ticketing solution (US!!!) to streamline your ticketing process and MAKE MORE MONEY! Best of all, it's ALWAYS FREE! Contact Us Try a Free Demo Download a Ticket Sample Sign Me Up! WE ARE THE ORIGINAL & LEADING PROVIDER OF TICKET SERVICES FOR DANCE STUDIOS. 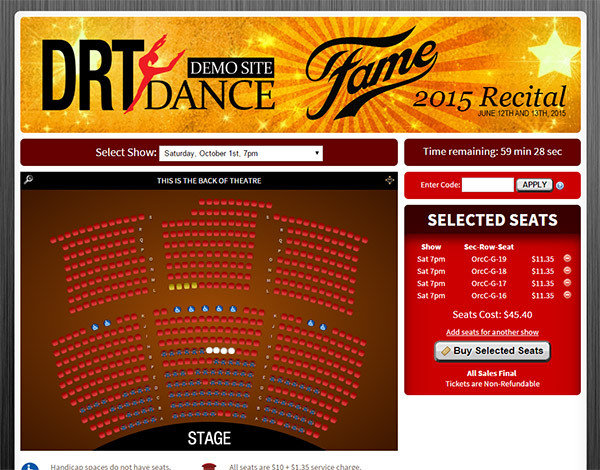 Since 2012 we have been the #1 rated provider of online ticketing specifically designed for dance studios. Our feature-complete, 100% turn-key solution brings the power and flexibility of a professional box office to your studio, at a price that you and your dance families can afford. We are, truly, a company that "gets it". Hey! Just want to let you know that the show went well and the online tickets sales has received nothing but positive feedback! Thank you for all of your help and making this process so much easier. I will definitely use your services again in the future and be sure to recommend to anyone who inquires. WHAT'S DOES IT LOOK LIKE? We can talk about our services all day, but the best way for you to understand it is to use it. We hear you! Click the button below to see samples of reserved seating, general seating, products/merchandise sales, donations, multi-tier pricing, graphical customization, real-time seat selection, and many other things. Answer a few simple questions about when, where, and how much, and provide to us a seating chart... We will handle all the details so you can sell your dance recital tickets online. We provide you a link that you can post on your website, facebook, or send out via email. View reports and download spreadsheets showing your sales, sold and unsold seats, and daily profits in real-time. See daily sales totals to help evaluate the effectiveness of your ticket sales to parents and family. There’s no need to wait until the end of the season to get your money. We send out payments to you every week. Start seeing your money confidently with a same-day direct deposit and mailed check options. Handle reserved seats for families with special needs, or block off seats for staff and students. Our system makes it easy to manage any special seating requiremens you may have. You can even reserve specific seats for specific people! 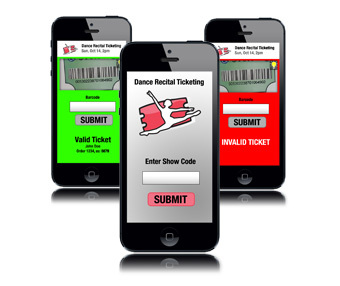 With our customized mobile application, available for both iOS and Android, scanning tickets has never been easier. Position the barcode in the display window and instantly validate the ticket. It really is that easy! AND... OUR STUDIOS LOVE US! ... I love the fact that every single time I called, I was able to talk with Josh or Stephanie directly and you were amazingly patient! ... Thanks and lots of love to you all! Thank you so much for all you did this year to make things easy for us. It is so appreciated. We loved using your company for the ticket sales. Everything went very well. We will be using your company again for our next season. We used your service without any issues for 3 of our recent shows. As an owner of a Dance Studio I think it's important to try other vendors every so often to see how the services compare. We chose to use another online ticketing supplier for our most recent show and I can assure you, I will NEVER do that again! From the beginning there were issues. Although I was assured that I would have an account management team that I would work with, I don't think the same person ever picked up the phone when I called. There was a HUGE problem with the first payout and it took them almost a week to figure it out. All in all, the service and product that Dance Recital Ticketing provides is leaps and bounds ahead of it's competitors. You have a customer for life! We made it through and it is OFFICIAL - THE BEST DECISION I'VE MADE FOR MY BUSINESS IN A LOOOONG TIME - DANCE RECITAL TICKETING! Without a doubt, from the onset of this project to the "finale" it was nothing but professional and informative help and suggestions. My site was professional looking, simple to use and if anyone had trouble (which was approximately 3 people who typed in the wrong email address) there was support that had any issue addressed and solved in an instant. I will be back again and look forward to this part of the recital being handled by professionals giving myself and office staff more time for other things come recital time. I had read many testimonials on your site that stated all positive things and I must add - WHY WOULD YOU NOT DO THIS FOR YOURSELF!!! I will be returning next year and look forward to crossing ticketing off my to-do list with a big fat emoji smile! For years, we dreaded ticket sale day! The lineups started hours prior to the start time and although we tried many options, nothing suited our specific needs. While doing some research on the internet, we found Dance Recital Ticketing and decided to give it a try. We are thrilled with the results. Our experience using Dance Recital Ticketing was amazing! Setup was easy and customer service was outstanding. Shows quickly sold out and adding an additional performance was instantly accommodated. We received positive feedback from our dance families! No more stress and lineups for ticket sales - Thank you! Thank you so much! Dance Recital Ticketing is the way to go! No worry ticketing. Just sit back and watch the sales roll in! We will absolutely use DRT next year! This system is so easy and convenient for our Dance Parents and our Staff! We won't sell tickets any other way from now on...Thank you!! I have been so pleased with your services! It has made my life sooooooooo much easier!! My experience with Dance Recital Ticketing has been amazing! I took over a studio last year and we always sold tickets to the parents and pulled them ourselves. For my first year the stress and thought of this was too much! I started looking into companies that helped dance studios sell tickets online. I found Dance Recital Ticketing by searching the web. I decided to go for it! I was so nervous, my first year as owner and I changed the way the tickets were sold for the past 22 years! Stephanie and Josh made me feel very confident that everything would go well. They couldn't have been more right!! I have recommended them to anyone who asks! Not one glitch! And anytime I had a question Stephanie and Josh were there to answer!! I am a very happy customer!! Thank you for your wonderful program and customer service. You made our lives easier for City Ballet of Cleveland which resides at the Cleveland City Dance studios. Our performances are always at a time when the studio is frequently taking registrations for the next semesters. It freed up the office staff to work on taking care of our clients more easily and reduced paperwork. Also whenever we or our customers had questions you were prompt in taking care of all. Thank you again and we will be using you again for May. Recital ticketing has been a huge pain in previous years and your system made it incredibly easy. Our customers had only good things to say about the entire process. I was concerned about people showing up at the door not having printed out either the receipt or the tickets but we didn't have a single occurence of that. We have every intention of using your product again next year. Thank you so much . This process was way easier and we will be using it again!!!!! Thanks for all your help! Thank you so much!!! Your ticketing system has been such a great thing for us and our clients. You can count on us using you every season for Christmas Show and June recital.